Two years after Hurricane Sandy some residents still struggling to recover have become organic experts on disaster response. But is anyone listening? Two years after Hurricane Sandy crashed into the U.S. East Coast, many people are still searching for relief. Months of spiraling through the recovery process have turned some residents into organic experts on aspects of disaster response. But it’s unclear if anyone is listening to them, especially among the network of institutions responsible for recovery and preparing us for the future. James Keady, a New Jersey resident and dedicated Sandy volunteer made headlines at the end of October when he tried to get the attention of Gov. Chris Christie at a press conference. With his typical brashness Gov. Christie told him to “sit down and shut up.” That single moment of rebuke, seemed to sum up the dismissive attitude hindering the state’s response. Contrary to the perception fanned by celebrity benefits and political boasting, the recovery is far from over. It never is a quick process to begin with. While some have been able to repair or return to a level of normalcy, there remain many who haven’t. For residents, the process of rebuilding has been slow at best and in the worse cases, painfully stagnant. The impact of any disaster is complex. It’s effects are as densely nuanced as the physical and social landscape where it occurs. And the response required for any acute or systemic disaster must be as dynamic, with meaningful participation and leadership by the people affected. Traditional, top down, aid models are not as agile as the communities they serve and too frequently ineffectual. The Federal Emergency Management Agency is asking some Sandy aid recipients to return a total of $5.8 million in relief money. Not as a result of any fraud, but because of the agency’s own mismanagement. And in a revelation that came as little surprise to some impacted residents, a joint investigation by ProPublica and NPR into the American Red Cross suggests they were more concerned “about the appearance of aid, not actually delivering it.” For their appearance the Red Cross netted $1 billion in donations. In the hours after Sandy made landfall in the United States on October 29, 2012, the notion of meaningful participation was forward on my mind. As the scope of the impact became clear, one of the interrelated responses I participated in was working with Rachel Falcone and Waging Nonviolence editor Laura Gottesdiener to start Sandy Storyline. 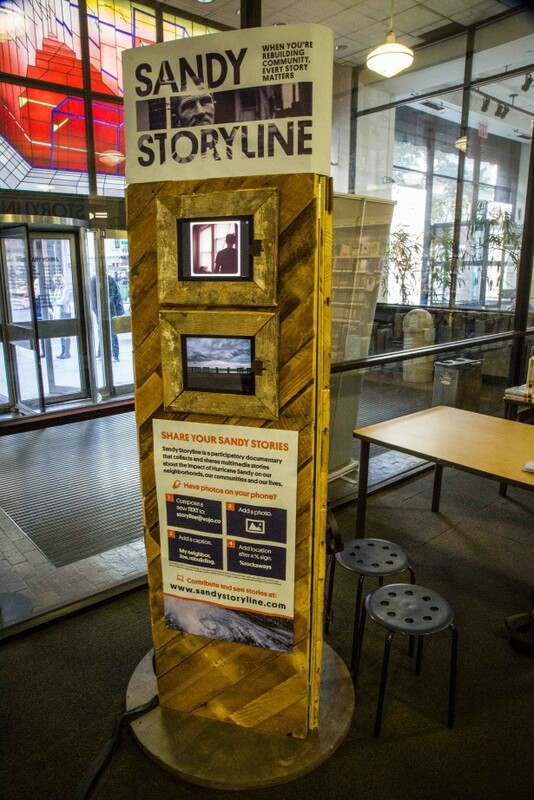 Launched in the week after the storm, Sandy Storyline is a participatory documentary that invites anyone impacted by the storm and its aftermath to contribute and share their story in photos, words, audio or video. Stories are shared through the website, syndication with media partners and interactive exhibitions. Our latest exhibition is currently touring local branches of the New York Public Library. Next year we will launch an immersive web-based documentary. By engaging people in sharing their own experiences and visions, Sandy Storyline is collaborating with contributors, and partners, to build a community-generated narrative of the storm and its aftermath. Hurricane Sandy was a devastating event that affected millions across the Caribbean and eastern United States. The multi-year rebuilding process will have direct implications on national policy and development practices in the era of a changing climate and increasing economic inequality. Hurricane Sandy, nicknamed “Superstorm” by the media, was a massive weather system that is a harbinger of things to come. As the storm moved north through the Atlantic Ocean, along the coast, it collided with an Arctic jet stream. The abnormally warm temperature of the ocean’s surface water had already intensified the strength of the storm. Typically, prevailing westerly winds blow Atlantic hurricanes out to sea where they dissipate. But the Arctic front pushed it into the coast. The unusual shape and atmospheric pressure of the jet stream and Arctic front was caused by the melting of Arctic ice because of climate change. With Hurricane Sandy we have an opportunity to see the complex impacts of one of the more “worst case scenarios,” in this new era of climate change-induced volatility. As Donna Battaglia demonstrated, Sandy Storyline offers moving portraits that broadcast what this “new normal” already looks and feels like. The challenge for communities, business interests and government is to interrogate these impacts in a way to ensure that both the analysis and outcome is shaped by the meaningful participation of the communities on the frontlines of impact. This is why we started Sandy Storyline. But we’re just one project. Some local and national newspapers have solicited stories and reader feedback. But disasters on this scale need many more projects like this, produced by independent and mainstream media outlets alike. We also need to strengthen the democratic mechanisms of our civic institutions so organic experts like Keady, and thousands like him, can meaningfully contribute without being told to “sit down and shut up.” And where these mechanisms don’t exist, we need to build new ones. The participation and leadership of affected communities won’t save us from future moments of crisis. But it is our best hope at making sure every segment of society is as resilient as it needs to be, to weather an uncertain future. The challenge for communities, business interests and government is to interrogate these impacts in a way to ensure that both the analysis and outcome is shaped by the meaningful participation of the communities on the frontlines of impact.